If all else fails, the cake is the main piece of food you should have. Every reception has a cake of some kind, no exception. The cake often reflects the theme of the wedding and often incorporates the wedding colors and/or flowers. Modern cakes are leaning more towards spectacular colors, shapes, and arrangements- from giftbox-like cakes to skyscraper cakes and from mixtures of shapes to brightly colored flowers and ribbons. Basically, there is no longer a pressing rule of making the cake white, anything goes. To figure out what style of cake you want, you’ll want to have most of your wedding shopping done- have your dress, colors, decorations, and location in mind when you pick out your cake. Make sure the cake you choose will coordinate with the overall theme of the wedding. If you are having a very formal wedding with a white and red theme, you will not want a topsy-turvy orange and lime green colored cake. Often it is easy to pick the decorations you want on the cake simply by looking at one of the components of your decorations. 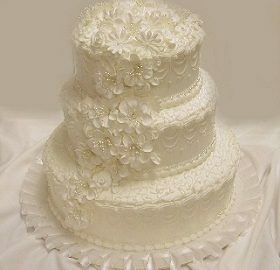 For example, some brides choose to duplicate the lace pattern from their dress onto the wedding cake; other couples may have a beach or garden theme that would work well with a cake. The decorations are not all you have to choose, there’s also cake shape and style. Once you have figured out the theme you want your cake to have, it is usually easy to determine the shape and style. If you chose to duplicate your dress lace, you’ll probably want something a little more formal like a tiered cake separated by columns. If you are having something more fun, you may be able to pull off something more modern like a cake with various shapes stacked on top of each other. For a mix of traditional and modern, you may choose a tiered cake composed of square cakes instead of round ones. Keep in mind that the more elaborate/colorful/large you want your cake, the more expensive it will be. After you’ve taken care of the “sight” details, you’ll want to focus on “taste” details. Even if you have the most beautiful cake, if it tastes bad, you’ll regret it. One of the best things to do is to set aside some time to “taste-test” cakes at different bakeries. Most of the time the store will be willing to do this and it is by far the best way to compare your potential bakers. Ask to try all the different flavors you have even thought of using, along with all the possible fillings and icings. A word on icings: many couples are choosing to use the very modern, very sleek fondant icing for their cake instead of the usual butter cream; however, not only is fondant more expensive, but it does not taste as good as butter cream. So, if you’re thinking about using fondant, do a taste comparison and ask the baker if they can do the smooth look using butter cream. After you have all of the “sight” and “taste” details, you’ll have to look into the price of the cake. This implies two things, the actual price of the cake (whether per slice or per cake) and the amount of the cake (since it largely effects price). As mentioned before, you’ll want to have a lot of your wedding planning done before you go cake shopping, this includes having a rough guest list, or at least an estimate of how many guests you are expecting. If you are having a lot of guests, but are on a tight budget, you may want to get a small-scale cake of your ideal style, taste, and decorations and then have sheet cakes to serve when the cake is gone. Some couples simply choose to have alternative/less expensive desserts to serve as well so that they can just cut smaller piece. So, speaking of cutting… when is it supposed to be done? Well, usually it is around the end of the reception- but not the last five minutes. You’ll want to do it after the bouquet and garter tosses, but you’ll want to leave time afterwards for more mingling and/or dancing. Many couples will tell the DJ or band a certain time that they want to cut the cake and the guy with the microphone will inform your guests that it is going to happen. You may choose someone else to announce it, or just send a couple of people through the crowd to tell everyone. Typically, the groom will put his hand on top of the brides as they cut the bottom layer of cake (don’t cut the top one- you’ll save it for your anniversary). Don’t worry, you and your groom won’t have to cut the whole thing, there’ll usually be one of the servers appointed to that task. Beware of high cutting fees though, and try to get out of them or find another company to deal with. No matter what style of cake you choose, you should absolutely love it. Don’t be persuaded by modern styles or family member’s ideas- just choose the cake that you want and let it be a reflection of your big day.